In April, I attended a session on RX Challenges at the HRE conference. The session was good, but the man that sat next to me kept leaning over and asking me what the acronyms he was hearing met. What's AWP? What's WAC? What's ICP? What's CVS? The language was so unfamiliar and had him so confused, he didn't even recognize CVS as the drug store chain. As five of us stood around chatting after the session, two other people said they were just as lost in the sea of acronyms. I didn't want that to happen during my session, so I put together this reference with a little design help from my colleague Kathy. If you're looking for more, here's a nice drug benefit glossary that I found online. Qualities that make for costly medication delivery, such as requirements for professional administration or special handling e.g., temperature control. Complex treatment administration e.g., infusions. Complex molecule composition e.g., biologics. High cost e.g., CMS uses $600 per month for Medicare. ASHA uses $1,000. Specialty medications may be covered under the pharmacy benefit or under the medical benefit. Generally, medications that require a professional to administer them are covered under medical. 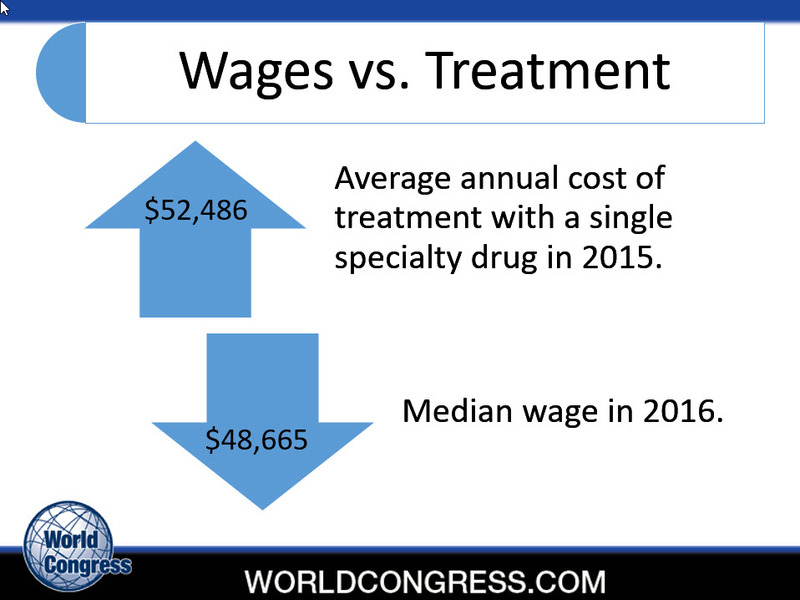 1-2% of prescriptions are for specialty drugs, but they represent 35% or more of overall pharmacy cost. There are 2,320 drugs in active development and 40 or 50 new drugs expected to be introduced in each of the next 5 years. We here about new very expensive drugs like Soliris all the time. Soliris is used to treat a rare blood disorder and it averages $18,000 a dose or $500,000 annually. As I said, it's rare and employers have stop-loss coverage to protect them if they have a member that takes it. What worries me more is how specialty medications have become the standard of care for many common chronic conditions e.g., rheumatoid arthritis, psoriasis, multiple sclerosis, HIV/AIDS and many cancers. Employers are seeing a lot of members taking drugs like Enbrel for rheumatoid arthritis at $60,000 a year or Otezla for psoriasis at $36,000 a year. If someone starts on one of these medications when he or she is 40, you may pay for them for 25 years. Longer if you offer retiree health coverage. 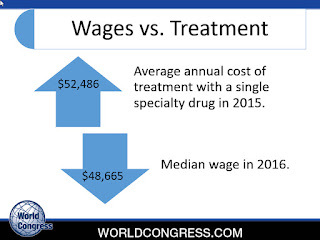 The average annual cost of a single specialty drug already exceeds wages. Value-Based Insurance Design (V-BID) is about shifting the conversation from how much to how well. Here's how the Center for Value-Based Insurance Design describes applying V-BID to specialty medication. Impose no more than modest cost-sharing on high-value medications. Use incentives to encourage patients to select high-performing providers and settings for their care. The headline of the July issue of Health Affairs reads V-BID Improves Medication Adherence without Increase in Total Health Spending. Note: On February 8, 2018, the Chronic Disease Management Act of 2018 (S. 2410 and H.R. 4978) was introduced in Congress. The bipartisan bill amends IRS Section 223 (c)(2)(C), which would provide health savings account eligible high-deductible health plans (HSA-HDHPs) the flexibility to cover services and drugs used to treat chronic diseases prior to neeting the plan deductible. I recently worked with Lauren Vela at the Pacific Business Group on Health (PBGH) on a project and here's how we described a value-based prescription drug benefit. Waste-free formulary excludes no-added-value, high-cost drugs. Some medications require a second opinion. Infusion services must be obtained in an infusion center, doctor’s office or at home unless it is determined that it is medically necessary to administer them in a hospital setting. I believe this is what employers should strive to create, but there are barriers. When I was at the Magellan Rx meeting in May, I learned that there prior authorization (PA) process isn't built to handle genetic testing yet. Some drugs on the market require genetic testing to make sure the patient is a candidate. Unfortunately, you can't rely on physicians to have performed the genetic testing before writing the prescription. Mercer did a study that showed that many times the genetic test wasn't done. That's pretty horrifying if you think about it. Patients could wind up on a drug (a costly drug) that will harm them instead of helping them. Obviously, this is something employers should look into and press for. It's also a good idea to make sure your health benefits cover the cost of the genetic testing. The Right RX genetic test shows you how a patient processes medication. It covers 21 disease states and costs $250. When the administrative and ownership dilemmas (i.e., who owns the results of the test--the patient or the entity that paid for it) get ironed out, it will change how formularies are constructed. They'll become much more personalized. The next step beyond plan design is outcomes-based pricing. Pricing medications based on the impact they have on a patients quality of life. Earlier this month CMS suspended a plan to pay for Norvatis’ Kymriah therapy based on how well it worked. The $475,000 gene therapy treats kids and young adults with leukemia. The arrangement would have been the first agreement with a manufacturer for outcomes-based pricing. The demise of the CMS deal illustrates how difficult it is to figure out how much government health programs should pay for expensive treatments whose long-term benefits are still unclear. CMS and Novartis discussed paying full price if Kymriah produced results in patients after one month — an unrealistically short timeline for evaluating a complex cancer treatment. What can we do? 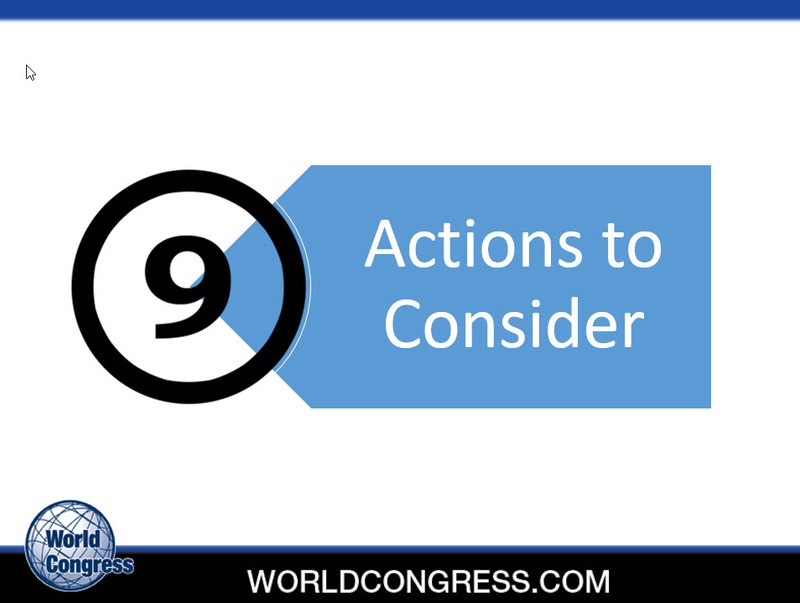 Here are nine actions that I think are worth considering. 1 Think in terms of total costs of care. Look at pharmacy spend across PBM and medical. Only 48% of employers receive reporting on drug expenses paid under medical according to a McKinsey Report. 2 Work to integrate your pharmacy and medical data with outcomes. Complete an audit across the medical and pharmacy plans to determine their current state and identify changes to improve management. Generate insights through data aggregation and analytics that will help you prioritize what you want to work on. 3 Evaluate your contract terms. Can you get the kind of reporting that you want for your disease management vendor? Does your PBM require providers to use NDC coding for Specialty Pharmaceuticals to improve monitoring and tracking of utilization? What percent of rebates are you getting? According to McKinsey, many large employers (e.g., 5,000 employees) have been receiving 100% of the rebates. In recent years, a growing number of smaller employers have insisted on 100% pass-through arrangements as well. In 2016, 39% of smaller employers received 100% of the rebates for specialty drugs, compared with 23% in 2015. I've heard the cut-off for getting 100% of your rebates is 4 million in drug spend. I personally would not attempt this without expert help. We contract with Mike Zucarelli at CBIZ to help us with our PBM. Folks at CBIZ refer to pharmacy benefit management pricing as a dark art. If that's the case, Mike is Harry Potter. 4 Strive to improve the consumer experience. Increase transparency. Help employees use cost calculators. Integrate pricing tools like GoodRX. Improve the mail order experience. Amazon bought PillPack and they have the capacity to set a new bar when it comes to mail-order pharmacies. 7 Review your plan design. Most employers use a three-tier plan design — generic, preferred brand, non-preferred brand. A growing number of plans are using four or more tiers. Most plans with three or fewer tiers use copayments. Plans with four or more tiers are more likely to use coinsurance. High-cost sharing creates a financial burden and increases non-adherence. 8 Use a center of excellence program to drive patients to high-value providers/settings. The Pacific Business Group for Health (PBGH) has an excellent program. 9 Consider contracting separately for specialty drugs. 60% of health plans use a PBM plus a specialty pharmacy with a separate contract. We can mirror that in the private sector. The specialty pharmacy essentially serves as a rebate aggregator. The Mid-Atlantic Business Group on Health publishes an excellent PBM Assessment. John Miller will be presenting an overview of the report and how to use it on August 7 from 12:00 to 1:00. You can register here. If you're not a member of your local business group on health, I highly recommend joining and getting involved.